Step 1: Colour 1 – Make a magic circle. Into the circle, make a slst. ch3 (counts as 1tr), 2 tr, ch4, 3tr, ch4, 3tr, ch4. Join with a slst into 3rd chain of first ch3. Fasten off. Step 2: Colour 2 – Join into one of the ch4 spaces with a slst, ch3 (counts as 1tr), 2tr, ch4, in the same space make 3tr, ch1. In the next ch4 space make 3tr, ch4, 3tr, ch1. In the last ch4 space, make 3tr, ch4, 3tr, ch1. Join with a slst into 3rd chain of first ch3. Fasten off. Step 3: Colour 3 – Join into one of the corner spaces with a slst and ch3 (counts as 1tr), 2tr, ch4, into the same space 3tr, ch1. 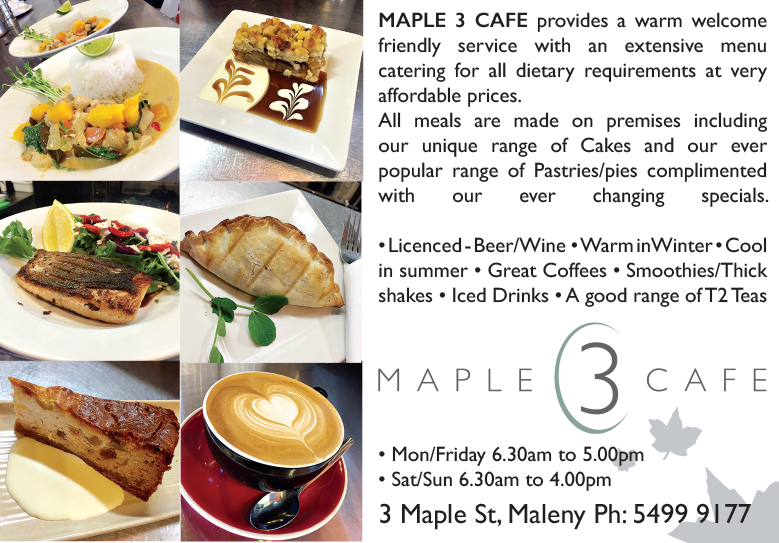 Along the side, make 3tr, ch. *Into next corner space make 3tr, ch4, 3tr, ch1. * Repeat * until the round is finished. Fasten off. 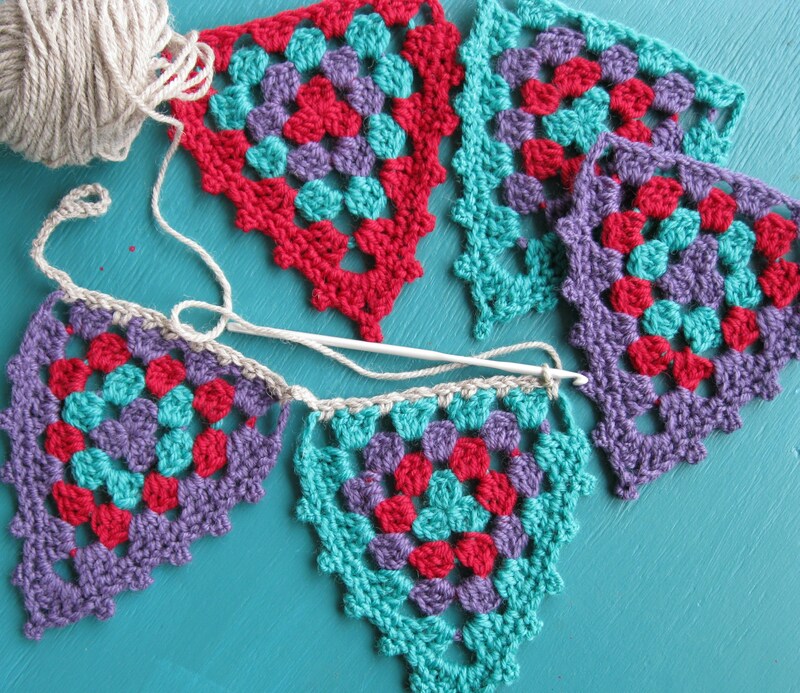 Step 4: Colour 1 – Repeat and extend pattern for Step 3. Fasten off. Step 5: Colour 2 – Repeat and extend pattern for Step 3. Fasten off. 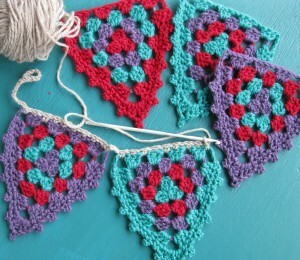 Step 6: Colour 3 – Repeat and extend pattern for Step 3. Fasten off. Step 7: Colour 3 – Join with a slst into the left hand side of a corner space. Ch1, dc into each stitch along the side of the triangle, including ch1 spaces. Into each of the ch4 spaces (corners), make 1htr, 1tr, 1dtr, ch1, 1dtr, 1tr, 1htr. Along the sides of the triangle, dc into each stitch, including ch1 spaces. To finish off the last corner space, make a slst, ch1, turn. 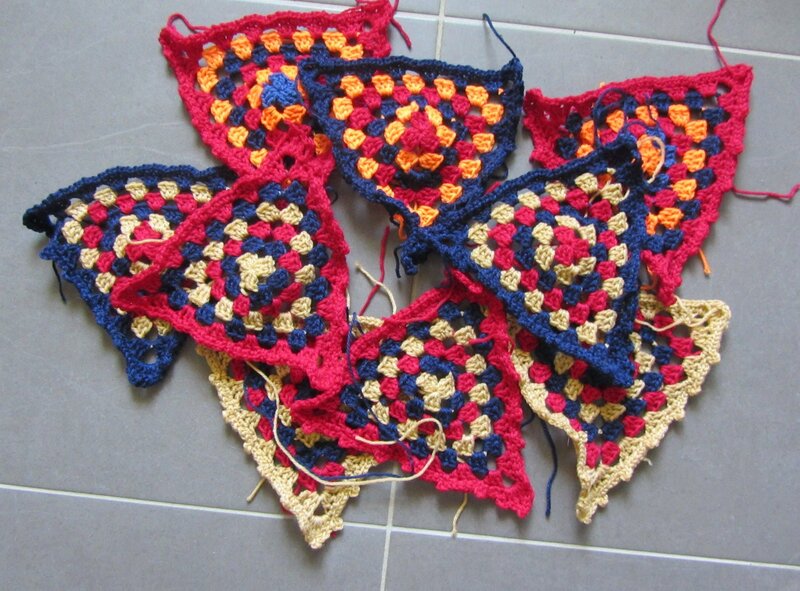 Step 8: Colour 3 – Slst into next 3 stitches, then make a picot (ch3, then slst into same or next st). Continue to slst along the sides and adding picots where appropriate. When you reach the bottom corner, be sure to make the picot in the very bottom stitch (ch3, slst into same st). Continue until two sides have been decorated with picots. Fasten off. 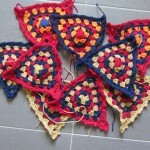 Sew lace along top of top of bunting ‘flags’ for required length. Ch50, dc across the top of one ‘flag’, ch10.Continue until the last ‘flags are attached. Ch50 and then fasten off.